Provide comfort for the family of Lori Berier with a meaningful gesture of sympathy. 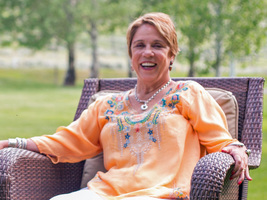 Lori J. Berier, 67, of Sun Valley, Idaho, passed away peacefully on March 18, 2019, at her home surrounded by loving family and close friends. Born March 25, 1951, and growing up in Manhattan Beach, California, Lori nurtured her desire for adventure, activity, the beach and outdoors. She had a passion for dancing, was a track star, exceptional volleyball player, and an incredible swimmer. she was one who never slowed down. Later in life her desire to be active transitioned to skiing throughout the Rockies, riding her bike, swimming in lakes and streams and enjoying all that Idaho has to offer. Her love for activity and the outdoors never wavered even with the many hurdles and challenges life threw at her. She could truly adapt to any situation or environment. Lori attended the University of California, San Diego majoring in Modern Dance, always one to pursue her passions. Prior to graduating she and the love of her life, Bret, found themselves in Ketchum, Idaho, in 1969. Arriving at midnight during a full moon, they knew they had discovered their home. The first place they stayed in Ketchum was a small log cabin that is now the Vintage restaurant. In 1970, with her husband Bret, she opened one of Ketchum’s first preschools, Happy Faces, in the original site of the Presbyterian Church. Many of the locals in our community today had their humble beginnings at Happy Faces. Lori’s desire for action and adventure soon beckoned and off she and Bret went to Mexico and Central America for two years. Again, a life-changing experience of roads to nowhere, villages speaking their own language dialect, and camping among ancient aqueducts and ruins. The love of Mexico was forever engrained and they continued to travel there every opportunity they had. Shortly after their return to Idaho, in 1975, Lori and Bret built their first home in the new subdivision of Della View in Hailey, Idaho. This started a long journey of designing custom interiors and home furnishings. By 1979 with a 4-year-old, Jasmine, and a newborn, Chloe, they opened Topnotch Fine Furnishings and Interior Design. For the next 35 years, Lori enjoyed planning and creating the interiors of some of the most amazing homes in our area to this day. Seeking out quality, style and uniqueness made her a highly sought after interior designer. Her desire to create brought her almost as much joy as working with clients who soon became lifelong friends. Combining her love for creating, design and Mexico, in 1998 Lori and Bret built their dream home there. It truly was something they cherished and as the years went by they tried to spend more and more time there. They created a wonderful family home on the beach for their family and friends to enjoy for years to come. Lori lived life to the fullest and in many ways was fortunate to have loyalty, love and dedication from family, friends and caregivers through her entire life. If she were here today she’d ask you to celebrate the incredible life she had and cherish each other, her legacy of family, and dear friends she has left behind. Her smile and positive outlook was truly a gift that her friends and family hold dear today. Life was full and the adventure grander with Lori in your life. She is survived by her mother Wanda Middough, two siblings, sister Linda Heydrick and brother Scott Middough; two daughters, Jasmine Berier (Dylan Stocker) and Chloe Berier (Grant Gager); five beloved grandchildren, Ginger, Van, and Coral Stocker, Cade and Grey Gager; and Micki Skudlarczyk, a daughter in spirit. A celebration of life will be held in late June for all family and friends to share a story or a few laughs. Friends may visit www.woodriverchapel.com to leave a message or photo and light a candle for Lori. To send flowers in memory of Lori Jean Berier, please visit our Heartfelt Sympathies Store. We encourage you to share your most beloved memories of Lori here, so that the family and other loved ones can always see it. You can upload cherished photographs, or share your favorite stories, and can even comment on those shared by others. Provide comfort for the family of Lori Jean Berier by sending flowers. An amazing woman with an amazing will. She will be so missed by her family and friends! Lori always had a smile on her face. What an example to us all. Life was not always easy but her strength and courage was an example to us all. She is soaring now. Life can be so unfair sometimes and this is is one of those times. I am in shock and utter disbelief and I am so sorry for the pain and loss to her friends and family. My sincere condolences.